I live in middle Georgia. There are seven people in my family: Mama, David (my brother), Mary (his wife), Emily, Sara, and Beckie (their three girls), and Rusty (my furbuddy). 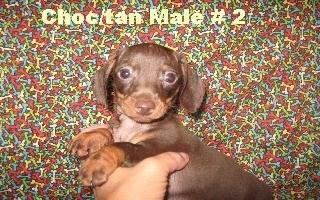 Rusty is an adorable chocolate and tan dachshund who is my furbuddy. since high school in the mid-60s. Yea for Katie and Congratulations to our new queen Sopo! Hi Ladies, I decided to drop in and say "Hi." I have been wondering what this thread was about. I have seen it several times. The weather was cloudy today and has been all last week. I am currently working on a friendship ghan. I have many squares and right now a few plans to assemble the squares as soon as I have enough. I have an adorable dog who lives with me. I named him Rusty. He is my furbaby. I hope everybody had a nice day. Katie, kimgoodie, and bgs, I could have used that manual. Unfortunately I did not have a clue who made the lift chair. Kertrina did not tell me. Thanks for reminding me about the owner's manuals anyway. That's good to remember. Katie, the lift chair is gone. They replace it with a loveseat. Only problem with that is I can't get up from that without help. bgs, Thanks for the suggestion and the kind words. I am a member of a church, but unfortunately they do not contact me. I do know some Christian people though. Thanks for the kind words everybody. Still working on the problem of the chair. Well, I am back again. I had hoped to have a surprise for you ladies, but I am the one who got surprised. Now to get you up to date. The chair I posted about is gone. Kertrina (lady who cleans my house and runs errands for me) finally came yesterday afternoon to see what happened. She looked at the chair and tried the hand help control and of couse it did not work. She diagnosed it as "the motor is dead." I don't know, but something didn't work and neither did the chair. Anyway, she said that she'd look for another chair. She said that she had a friend who had a nice recliner and this friend would sell it. She went to the lady's house and called me from there. She told me that the chair was nice and in good condition. She said there was only one thing--the chair was a rocker recliner instead of a rocker. I had had a rocker recliner when I was 30 years old and I had a terrible time getting up out of it then because it wouldn't be still when I started to stand up. I don't want another when I am 66. I said to Kertrina, "Can I say what I think?" She answered, "Yes." I said, "That would be hard to get out of. I don't want that." Kertrina agreed that the rocker recliner was not a good idea and she told me that she was going to another place to look at a recliner there. After awhile, she called me and told me that she had found what she thought was perfect. She said that it was a loveseat and it was green (my favorite color) and it was in good condition and would I want it? I said yes and she told me that she would talk some more to the lady about the price and then she would come to my house with the loveseat. She did come. It was after 6:00 yesterday. She had brought two men with her and they carried the lift chair out and then carried in the loveseat. At the time, I was seated in the other chair in my living room. I was holding Rusty. The men left and I thought that things had turned around and I could finally go through the mail and open those wonderful puffies. That was what I had planned to do this afternoon. However, that was not to be because of another problem that arose. I didn't sit on the loveseat last night. I thought that I would wait until today since I was already set in the chair I was already in. I had cheeseburgers, potato salad, baked beans, and a Coke and Rusty in my lap so I was satisfied. Then it was morning. This morning, I went over to the loveseat and looked at it. I looked especially at the seat and it looked just the right height--neither too low nor too high. I sat down in this seat and I must say it was very comfortable. However, two problems arose shortly thereafter. I solved one. I couldn't get the footrest all the way out. I did press the button and push back on the arm of the loveseat and the footrest came out, but not all the way and it did not lock. I finally accidentally solved the problem. I called Kertrina and left my number. After not being able to get in touch with her as usual, I was fussing to Rusty about the footrest not coming all the way out and I pushed against the back of the loveseat with my back and the footrest came out and locked. I should say that I had tried to close the footrest before this and it had closed, but not all the way so I was fussing to about the stupid footrest. When I pushed at the recliner twice with my back, the footrest came out and it locked. I tried closing it by kicking the footrest and it closed and locked. Problem solved. However, there was another. When trying to get up to go to the kitchen and fix lunch, I discovered that I could not get up from the loveseat. I tried three times. I tried by myself. I tried by using an old walker of mine (broke my right foot in 89), and I tried by putting the small area rug under my feet so they wouldn't slide and I used the walker. I still couldn't get up. I spent the morning and most of the afternoon in that loveseat. I was waiting for Kertrina or her son E.J. to come by and help me up. They never came. I did finally call the EMTs and let them know I needed help getting up and the dispatcher sent the EMTs and now I am up. I think that I am going to have to buy a new chair. Hi everybody, I have not been able to leave the office much . I will say that I have 4 puffies and as soon as I get something settled about the chair (or a chair), I will leave here and go into another room. The situation here is: the lift chair is out. That was the only chair that I can sit in. There is another chair, but I think that it is too low for me if I remember correctly, and I might not be able to get out of it. I am currently sitting in the office chair that I bought from Office Depot back in 99. I have been working on unloading the yarn from the extra chair in the living room and I am going to be brave after a little while and go and try sitting in it. I think with a cushion in the seat, that I could get up and down, but I don't know. I have had to make two trips to unload all the yarn that was in the chair. I finished that just while ago, but then I saw bugs and so I am back here giving the bugs a chance to leave. I will go back in a little while when I get my breath back. The last trip to the living room, I did bring one of the cushions and I looked at the cushion in the chair and compared it to the lift chair and I believe that I could sit in this second chair with no cushion, but I'm going to put it in anyway in case. When this situation is all over, I will open the puffies. I promise. I am doing my best. How is your day?